How Facebook can destroy your marriage! It’s happened yet again. 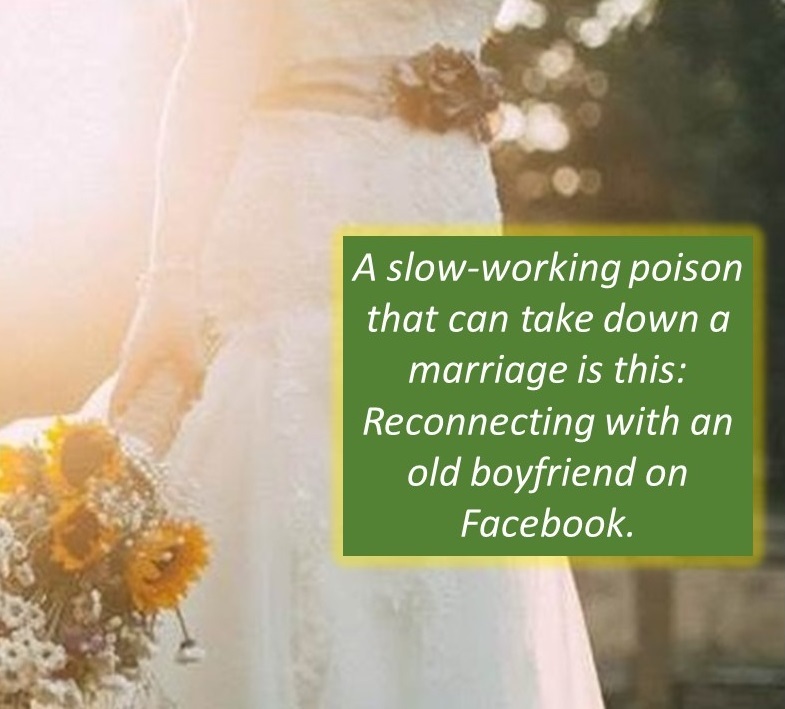 Another wife almost blew up her marriage, and it all started with Facebook. Don’t get me wrong. I’m not against Facebook. I love keeping in touch with what’s happening in the lives of my friends and family through Facebook posts. However, the devil takes warped delight in taking something good and turning it into something disastrous. We need to be wise to his schemes to kill our marriages! Here’s what the scheme looks like: You become curious about that old boyfriend or man from your past, so you look him up on Facebook. It seems totally innocent. You’re just curious. Then you pop him a little message asking how he’s doing. He responds. You guys reminisce about shared experiences in the past. You begin bonding emotionally. Then ever so slowly and slyly, Satan starts to reel you in. Soon, you begin believing that he’s your true soul mate, and an affair is just a step away! This is happening every day across America! One recent post on a divorce website noted that 20% of all divorce petitions contain the word “Facebook”. Don’t let this happen to you. As wives, we must be aware of Satan’s schemes and we must fight against the temptation to connect with any man on Facebook. 1 Peter 5:8-9 says, “Be sober-minded; be watchful. Your adversary the devil prowls around like a roaring lion, seeking someone to devour. Resist him, firm in your faith…” Please don’t shake off this warning. Fight against the urge to connect with men from your past on Facebook!